Almost two decades ago, when the future of the historic Education Building was in serious doubt, two BYU students watched with increasing concern as the vacant building deteriorated. As they watched, vandalism increased. They feared that the only piece of decorative stained glass on the building might be only days away from being smashed out by rocks. They decided to try to save it. As the story goes, the two students broke into the Education Building late one night and carefully chiseled the decorative window from its frame. After graduation, one of those students boxed up the window in a crate and moved it with him to California. He stored it in his garage for a number of years. During the reconstruction of the Education Building, the small stained glass window was returned to its original place. Historians are unsure of who designed and created the window, when it was assembled and installed, or what significance it had to the school, but it adds a definite touch of authenticity to the beautiful restoration. 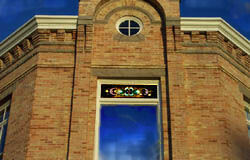 The stained glass window at Academy Square was restored by a former BYU student. An historic stained glass window now sits in its original resting place in the 110-year-old Brigham Young Academy after two BYU students took it in 1989 to protect it from vandals. 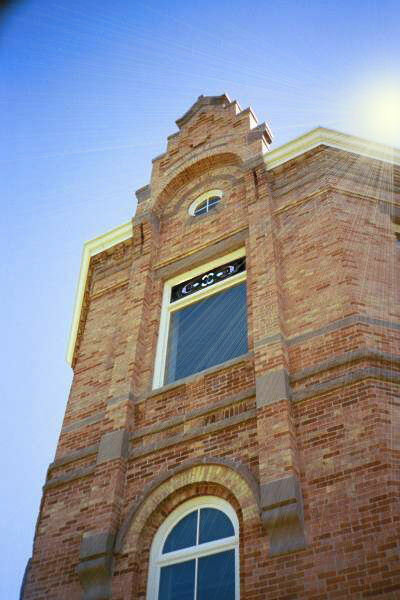 This west-facing window was put into place on the third floor of the building on University Avenue in Provo during the late 1800's. When the stained glass window was installed has not been documented. 1960s view from BYH window. Perhaps for as much as a century, this window sat in the same place, until the structure was abandoned in the early 1980s. After BYU sold its alma mater BYA building to private owners in 1975, the building fell into a bad state of repair, said Merrill Bingham, the director of public works for Provo City. The masonry work was crumbling, vandals were common and pigeons lined the floors with up to six inches of waste in some areas of the building, Bingham said. Two BYU students, Scott Creer and Ed Creer, noticed the dilapidation of the Academy building in the late 1980's, Bingham said. Scott Creer had a hobby of preserving antiques and said if the stained glass window was damaged, he would take it, Bingham said. About a year later a portion of the antique window was shattered, he said. With the help of some scaffolding, the two BYU students removed the window during the early morning hours on January 1, 1989, Bingham said. After that, Scott Creer moved to California and took the window with him. While there, he replaced the broken panel with some glass he obtained from Europe, said Chris Allen, the events coordinator for the remodeled BYA structure. No one related to the BYA building reconstruction knew what had happened to the window, Bingham said. During the renovation of the building, architects did not know what to do with the empty space that was once occupied by the stained glass window, said Terry Howard, the executive assistant for the Provo Library. When Bingham was appointed as a member of the Library construction oversight committee, one day he happened to walk into the sheet metal business of Ed Creer, the friend who had helped Scott Creer remove the window. As Ed Creer and Bingham talked with each other, their conversation turned toward the BYA building. "Oh, by the way, I know where the stained-glass window is," Ed Creer said. Ed Creer even gave Bingham the telephone number and address of Scott Creer in California. Bingham contacted Scott Creer and they made arrangements to have the window transported back to its original resting place. 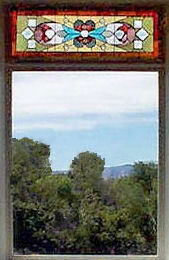 Today the small but colorful window can be seen in its original location high on the third floor of the Provo City Library at Academy Square.